These are the first of our Pig Framelocks; a limited run of 8. 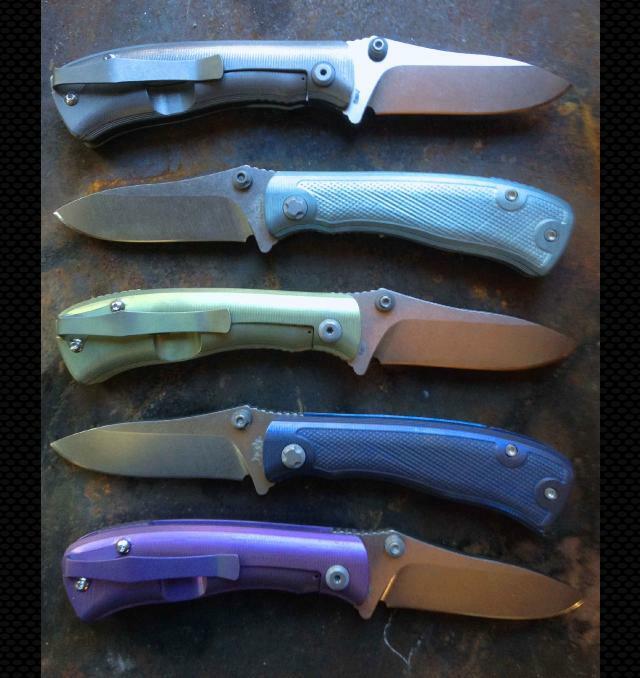 We had a lot of fun with these, the titanium handles are anodized a variety of colors, from steel blue on the second to the top, to gold, dark blue and purple on the bottom. Each handle slab is 1/4" thick solid titanium, one side is checkered. The custom thumb stud is also titanium and made in house. The rest of the knife is pure Pig...check out it's description here. Excuse the pic, as it is just a shop pic taken on my welding table, I'll have some better ones with some closeups soon. If you are interested in more information or pricing, E-Mail us. Contact info at "info at RedBladeKnives.com" Red Blade Knives, a maker of fine folding knives. Made in the USA. Tactical Folders, Knives, CPM 154, CPM 3V, Titanium Liners, Textured G10 grips, military utility knife.